"Extract of a letter from Edward Carrington to James Madison: The Election for Senators came on yesterday and terminated as I gave you some reason to apprehend in my last - the Ballots were as follows: for R. H. Lee 98, for Wm. Grayson 86, for Jas. Madison 77 the whole number of Voters was 162, 62 whereof were given singly to you, of those Cast away Mr. H. got 26, and the remainder were distributed to many others." The Papers of James Madison. 336. "Extract of a letter from Edmund Randolph to James Madison: The ballot was opened on Saturday, and at least fifty gave you single votes; that is threw their other votes on persons, not nominated. To the mortification, and grievous discontent of the advocates for order and truth, the numbers were for R. H. Lee 98, for W. G. 86 for J. M. 77. There was a greater body, then we calculated upon, 164 having unexpectedly voted." The Papers of James Madison. 339. 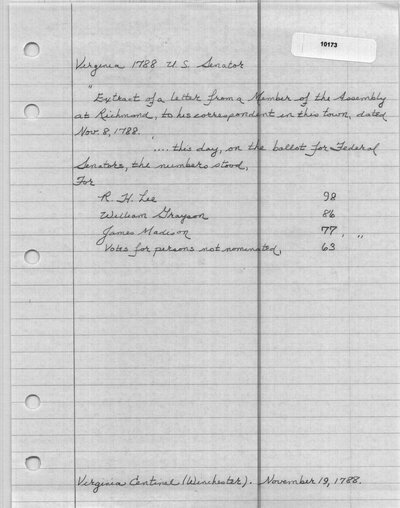 "Extract of a letter from George Lee Turberville to James Madison: R. H. Lee and William Grayson were yesterday elected to the senate - the Ballot for the first was 98, the second 86 and for you 77, 63 single Votes were given to you and if the Election had been delayed untill tomorrow I do religiously beleive you wou'd have been elected." The Papers of James Madison. 340. The Virginia Centinel, or, the Winchester Mercury (Winchester, VA). November 19, 1788. The New-Jersey Journal, and Political Intelligencer (Elizabethtown, NJ). December 10, 1788. Mattern, David B., J. C. A. Stagg, Jeanne K. Cross and Susan Holbrook Perdue, ed. The Papers of James Madison, Congressional Series. Vol. 11. Charlottesville, VA: University of Virginia Press, 1977. 336, 339, 340.